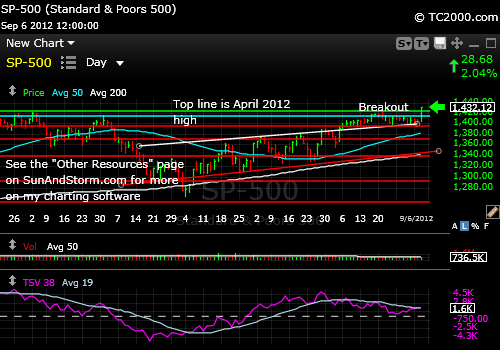 UPDATE 9-6-2012 9:41 pm: NOW we have a fresh breakout for the SP500 Index. The breakout is supported by a collapse in the VIX volatility index, a collapse in the 10 Year Treasury Note (see comments below), breakouts in both the banks and in housing (the two culprits of the financial crisis), and weakness in the US dollar. See my Twitter comments on the right side as well and the CHART below. The dollar(UUP, USDX, EUR/USD) must break down a bit more or at least go sideways to keep all the current m0mentum going in stocks and metals. Given the dollar’s recent weakness, it is not surprising that the metal market is still on fire as noted in this week’s text. The following chart shows today’s breakout. A fresh breakout for the SP500 Index. UPDATE 9-5-2012 11:08 pm: We are STILL below 1415.32, so the Bulls do NOT have the ball. Last week I claimed the market was “topped out.” It continued to act like that, despite the slight blip up in the gentle down trend that began with the reversal on August 21st seen on the chart below of the SP500 index (SPX, SPY). Notice the little shelf formed by the two August lows on the daily chart. When we breach that, you’ll know that the 50 day moving average will be the next target. The Bulls could claim there is not that much distance between the close on Friday and the last top, so there could be another reach for glory before the fall. Speaking of fall, it is close to being fall, which means we’re in September which has a bad reputation among traders after a long run to the upside, which we’ve had. Remember that if new highs in the SP500 Index hold, that will erase all the bad technicals. The catch is that sometimes the market takes in the suckers for a day and then pulls the rug, so be sure any new high that is achieved lasts through the 3rd day or so before committing grandma’s or grandpa’s money. The VIX (volatility index) held ground on Friday and has plenty of room to the upside to support a sell-off. Investor sentiment by AAII shows the Bulls dropping from 41.96% to 34.72% and Bears rising from 25.87% to 32.64% this past week (ending on Weds. night). The Bull-Bear Spread dropped from 16.1% to 2.1%. That is quite a fall in one week and suggests that investors are non-convicted. Lack of conviction near tops is likely to hurt the Bulls! My metal recommendation to buy gold has continued to be correct this week. Silver has also been a big winner despite the fact that it insists on bursting up faster than investors can pile on. My concern longer term is whether the economy will actually slow even more and since the emerging markets are doing the worst and China is slowing month after month, I would expect silver buyers to disappear in China (FXI) and India (PIN) as their near term prospects dim. But for now, the trend is up and the pile on happening. The best buying point for silver was during the easing back to support on Thursday. Wait for a bit of a pullback before adding to silver positions. A 50% retracement of Friday’s move may be the best we can hope for during this rally. The CRB index also broke out on the daily chart and on the monthly chart as well. Not good news for the Federal Reserve on the inflation front. The rise in commodities restrained them the last time they printed money. The other more important question beyond the blatant misuse of executive power is what Obamacare would do to the economy, particularly jobs. It seems clear that instituting the program will greatly limit job creation by small businesses. If you have evidence to the contrary, please pass it on to me! Guess where the vast majority of jobs are coming from in this tentatively recovering economy? You got it. Small businesses! So right or wrong as an idea, Obamacare is exactly what the economy does not need right now. While many features of the Obama Health Plan are needed (no one should go bankrupt because they are sick, being insured for pre-existing conditions is a must etc. ), the timing may be off, particularly the costs planned for small businesses at a risky time for the economy when those businesses are the top source of new jobs. Tell of the week: Watch the US dollar index futures (USDX) this week. If the dollar breaks the June and August support levels, stocks will benefit and so will the metals! By the way, if you “liked” this post, please “Like” it at the “Share” arrow below and/or re-Tweet it below. Copyright © 2012 By Wall Street Sun and Storm Report, LLC All rights reserved. This entry was posted in gold, gold etf, investment, Market timing, S&P 500 Index, trading, Treasuries, volatility index and tagged gld, gold etf, market timing, sp500 index, spx, spy, tnx, VIX, vix volatility index, volatility index. Bookmark the permalink.